TAKE ONE MOMENT TO TELL SOMEONE ABOUT US AND ONE MOVEMENT TO PICK UP A PIECE OF TRASH! THAT'S ALL IT TAKES TO MAKE A DIFFERENCE!! Learn to soar RC gliders! 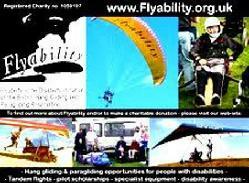 Teaching people with disabilities to fly! NEW LOWER PRICING, BUY ALL THREE BOOKS - PRICE WAS $ 49.95 BUY NOW FOR ONLY $35.95, ANY 2 BOOKS FOR $26.95, ANY 1 BOOK FOR $14.95. THIS IS ONE OF THE MANY "TRUE" STORIES FROM OLE OLSON, WILD BLUE Yonder NOVELS. GET READY TO HOLD YOUR STOMACHS IN LAUGHTER! Waves tossed the shore, the sun was setting, and the gringos were getting drunk, glad to have survived the journey thus far. They had left Valle de Bravo two days earlier, and driven hard for the border with Guatemala. There were two ‘muscle’ trucks following Walter, and they too, were full of gringos. Walter was glad to have the support. At one point during the journey, Walter’s caravan was joined by a Green Angel riding herd and an ambulance bringing up the rear. It just doesn't’t get any better than that while traveling in Mexico. But this evening was for celebration; the trip south was near an end. From here it was only one more day of travel through the Guatemala border at Tecun Uman, along the low-land jungles, and then up to the high alpine lake of Atitlan. They found a popular seaside restaurant and made themselves at home. There were two pilots from Colorado, Kevin and The Kutcher. Walter didn’t know the origins of The Kutcher’s moniker, and he didn’t inquire, but the Kutcher was regarded as a slightly unstable Vietnam vet. Let sleeping dogs lie, he thought. Kevin, at least, seemed a normal sort for a glidehead. There were also three kids from Kitty Hawk, in North Carolina. They drove their Dad’s new Chevy Suburban, and otherwise traveled in style. As pilots, they seemed pretty green. Dave was their leader and did most of the talking. Tommy didn’t say much. Will said nothing at all. He was a gangly kid who seemed painfully shy. In the two weeks or so that Walter had known Will, he had uttered nothing to Walter beyond a simple “Uh huh” or “Uh uh”. Not exactly an outspoken sort, he was happy to let Dave do the talking. Traveling in the Ford-From-Hell with Walter were Danny and Denny, gringo flyers extraordin-air. Danny had plenty to say, and kept Walter informed of all developments. Tonight they sat in the tropical breeze and ordered cocktail de camarón, cocktail de pulpo, ceveche and filete de pescado. It was a sumptuous repast, washed down by mucho cervesa and tequila. As the sun set, the naked overhead lights came on in the restaurant. There were Mexican families dining also, but no other gringos for miles in either direction, they had just come too far south for that.Dave noticed them first, “Check out the lizards!” he said.They were tiny lizards, attracted to the bugs that flew around the light bulbs. They waited patiently on the ceiling and walls, stalking their tiny prey. “Those are geckos,” said Walter. One of the critters darted along the wall and scarfed up a bug. The geckos had sticky little feet that allowed them to scamper across a vertical surface. They could even scamper along upside down with ease, as though glued to the ceiling. The gringos, unanimously, liked the geckos. Danny stood on a chair and chased a gecko, turning the tables on the poor thing. The hunter had become the hunted. The gecko saw the gringo coming, and dove off the wall. Landing at Danny’s feet, he scampered away across the floor. The gringo gave chase, but the gecko scooted under a nearby table. Danny was forced to give up the chase and focus on another gecko. More tequila arrived at the table, and the hunt was postponed in favor of inebriation. There were cheers of “GUATEMALA!” and “ATITLAN!” as the gringos knocked back the fiery swill.Danny continued his hunt, and soon caught an unlucky gecko. He held it up by its tail, but the critter simply left his tail behind, leaving Danny with nothing but the wiggling appendage. He tossed it off among drunken laughter and sought another, whole gecko. A paltry sum actually, at the exchange rate of three thousand pesos to the dollar, this amounted to about seven bucks. “Twenty thousand” would buy a case of frosty Mexican cervesa, however…“Twenty thousand, twenty thousand!” The pesos were quickly laid out on the table. The other diners had noticed the fuss, probably didn’t quite understand exactly, but when Will held that startled gecko over his head and stared it down, when he opened his maw wide and waggled his tongue, there was just little doubt what would transpire next... The gringo slipped the gecko into his mouth, and swallowed. “Gulp!”, went his Adam's apple. “Bwaaa ha ha ha!” screamed the delighted drunken gringos.The Mexicans quickly gathered up their small children, keeping them close should the foreign devils design to eat other, more precious, creatures. The gingos slapped their new hero on the back, by way of congratulations. “Wait!” cried Danny, who always had a better idea… “I’ll give you ten thousand more pesos to puke him back up!”Will’s cheeks bulged slightly, as though the mere thought had caused a gag reflex, but he simply held out his hand and said, “Put yer pesos where yer mouth is.” It seemed he was becoming, with each drop of tequila, a bit more brave, a bit more eloquent. The foreign crowd loved him, but the locals weren’t quite so sure. Danny pulled a wad of peso notes from his pocket and slapped a ten thousand note in Will’s hand. Will secreted the bill in his shorts and stuck his finger down his throat. He hunched over and gagged a few times and the gecko hit the dirty floor in a pile of spittle. It lie there for a moment, perhaps bewildered by its strange journey, then perked-up suddenly and scurried off towards safety, leaving a trail of Will’s drool behind. The place went wild. As the gringos all slapped Will on the back, the Mexicans gathered up their kids and belongings and sought the nearest exit. They had some concerns about what might come to pass next, guessed Walter. The gecko climbed the wall to resume his hunt, no worse for his journey.